The interesting transfer hike to Reka e Allagёs begins with an ascent to the Lumbardhi ridge, a vantage point which offers breathtaking views towards the surrounding mountains and Milishevc. It then continues with a steep descent to Rugova Camp Hotel before continuing up along gravel roads to Reka e Allagёs. Bonuses of this hike include drinks at Rugova Camp and delicious traditional food served with warm hospitality at Reka e Allagёs’ guesthouses. For a less challenging hike, the trail can be separated into two days. The first day would involve an ascent hike 9.1 kilometers long to the Lumbardhi ridge and the steep descent to Rugova Camp (WP 11d, tel: +38 (0) 44-248-270) where accommodation can be found. 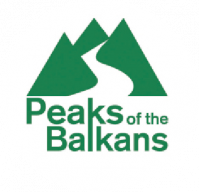 The second day will involve a 6.8 kilometers hike from Rugova Camp to Reka e Allages village with a gentle ascend along the gravel roads. Our ascent north is along an unclear, but easily orientated track that arrives at a pass (WP 2d). From the pass we continue north towards Guri i Kuq Mountain which can be identified by its red rock formations. When we are about to approach the mountain wall, we reach a broad path which takes us to Pusi i Magareve (WP 3d) – a small lake for cattle. We follow the path north with the lake on our right and then begin a steep descent north at WP 4d along a mule track. At WP 5d, we reach a dirt road that we follow until we take a left turn at the junction (WP 6d). The hike continues along a mule track through the forest. 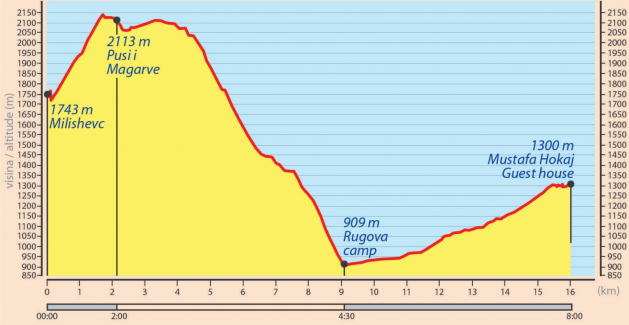 Our descent follows north along the mule tracks, dirt roads, and some junctions (see the waypoints list for the directions) until we reach Rrugova Camp Hotel which is located next to the main road. Rrugova Camp is an inviting place to have a rest before finishing this day hike at Reka e Allagёs village. From Rrugova Camp one can either hike to Reka e Allagёs or take a taxi. The distance left from here is 6.8 kilometers and the trail goes 1.7 kilometers along the main road, followed by the remainder along a gravel road. We stayed at Mustafa Hakaj’s guesthouse (WP 15d) located in the Hokaj neighborhood of Reka e Allagёs village.